A powerful earthquake struck New Zealand near the city of Christchurch on Sunday, with strong jolts felt over 120 miles away in the capital, Wellington, according to the United States Geological Survey. The magnitude-7.8 quake struck just after midnight and was centered 57 miles northeast of Christchurch, according to the USGS. The quake knocked out New Zealand’s emergency call number, 111, for about 10 minutes, police reported. It caused items to fall from shelves and windows to break in Wellington, and forced hundreds of tourists onto the streets as hotels were evacuated. The full moon of November 14, 2016 is not only the biggest, closest and brightest supermoon of the year. It’s the closest supermoon since January 26, 1948. The moon won’t come this close to Earth again until November 25, 2034. Should you watch for this full moon on the night of November 14? Sure, and, if you do, it’ll be beautiful. But, for us in the Americas, the moon is closer to full on the night of November 13. In addition to saying Donald Trump will move the embassy to Jerusalem, which she called “the eternal capital,” she also said he supported her conversion to Judaism before her marriage. Asked how Judaism has inspired her to be what she is today, Ivanka Trump said, “I feel like Judaism helps your moral compass.” Judaism “has been a great blessing in my life,” she added. 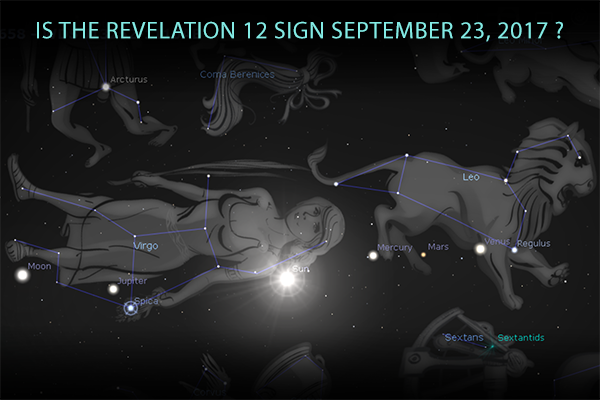 On September 23-24, 2017 there will be an astronomical event in the sky involving the constellation Virgo which looks remarkably like the ‘great sign’ that is described in Revelation 12:1 when reading the prophecy as literally as possible. This event is similar to the Star of Bethlehem theory which was developed around 2001 by lawyer and professor Rick Larson of Texas A&M University using today’s modern tools of astronomical software like Stellarium, which accurately displays what the sky looked like or will look like from any location on planet Earth, for any date. The compelling story that has been developing for the last 3 years is only becoming more interesting and is worthy of consideration. Before I begin to share the story I want to emphasize that what is being discussed has everything to do with astronomy and Biblical prophecy, but has nothing at all to do with astrology (fortune telling by the stars) or date setting which is the confident proclamation that the Rapture of the Church is set to occur on a specific upcoming date and time. To be fair, this story is conjecture, as any opinions put forth have been formed on the basis of incomplete information. First, let’s start with a few scriptures to keep in mind while considering this. So in searching out the meaning of the prophecy found in Revelation 12, we see that God placed the stars and planets first and foremost as ‘signs’. We also see that giving consideration to the Constellations is not something God prohibits, as the Hebrew word ‘Mazzaroth‘, which is only mentioned in Job 38:32, literally means the 12 signs of the Zodiac and their 36 associated constellations. Let’s take a look at a couple of the original Hebrew word in Genesis 1:14. The word for ‘signs‘ is ‘owth‘ which means a ‘sign’, a ‘signal’, an ‘omen’, a ‘warning’. The word for ‘seasons‘ is ‘mow’ed‘, which means ‘the appointed time’, ‘sacred season’, ‘set feast’, the ‘appointed time or signal’. Keep these two words in mind. On November 20, 2016 the planet Jupiter enters the torso area of the constellation Virgo, the Virgin. Historically, Jupiter is referred to as ‘The King Planet’ by many cultures. The Hebrew name for Jupiter is ‘Tzedek‘ which means righteousness, as in Melchi-zedek, the High Priest. So what we have here is a picture of the conception of the King of Righteousness entering the womb of the Virgin. However, while in exile on the island of Patmos, John the Revelator was given this vision some 80 years after the birth of Christ, so if the picture is prophetic it must have some other significance, as it is obviously not foretelling the birth of Christ. Now the planet Jupiter starts to do something interesting after entering Virgo’s womb that is called ‘Retrograde’, which as a result of Earth’s elliptical orbit, which causes Jupiter to appears to move back and forth within Virgo’s womb for a period of 9 months, 2 weeks and 6 days…which is 41 weeks, or 293 days total, which is the normal gestation or period of time between conception and birth for the development of a human baby. On September 9, 2017 Jupiter the Righteous King is birthed by exiting from in between the legs of Virgo. 2 weeks later, on September 23, 2017 we see what is being called the Revelation 12 Sign appear in the heavens. Using Stellarium software, if you have enough patience, it can be shown that this particular event has not happened since the birth of Christ, and does not happen again for at least several hundreds of years in the future. At some point, looking for another occurrence just seems to be a fruitless endeavor. Specifically, what happens is the constellation Virgo is clothed in the Sun, with the Moon at her feet, and above her head are a crown of 12 stars comprised of the 9 stars in the constellation of Leo the Lion of Judah, and the 3 planets Mercury, Mars and Venus. Now understand this, 2,000 years ago people did not know what a planet was. Their understanding was that these celestial objects were bright like stars, but unlike the stars which were fixed in their relative positions, they moved across the sky, so the word ‘asteres planetai‘1 was used to describe the planets, which in Greek literally means ‘wandering stars’. So here we have 9 stars + 3 wandering stars for a total of 12 stars above Virgo’s head, just as is described in Revelation 12. Passover (Pesach) … Jesus died on Passover. Pentecost (Feast of Weeks or Shavuot) … the Church was born. Feast of Trumpets (Yom Teruah, also known as Yom HaKeseh which is the ‘Hidden Day’) … thought to signify the Rapture. Day of Atonement (Yom Kippur) … thought represent Israel being reconciled to their Messiah, Yeshua. Feast of Tabernacles (Succot) … the 2nd Coming, when Jesus / Yeshua returns to Earth with His Church, to defeat Satan and to rule from Jerusalem. Since God fulfilled the first 4 Appointed Times to the day, and since God is a God of order, is it unreasonable to expect that He will follow through with the pattern He has already established, and fulfill the last 3 Appointed Times to the very day? Part of the difficulty in considering this possibility is tied to the Church having lost touch with her Jewish roots these last 2,000 years. Jesus is a Jew, the disciples were Jews, and the Bible was written by Jews. Another part of the difficulty in understanding the Bible to it’s fullest is that we read the Bible in English, which is translated from Latin, which is translated from Greek. It really helps to use a tool like BlueLetterBible.org to dig into the original Greek, or original Hebrew in the case of the Old Testament, and to search the usage of specific words throughout the Bible. However, according to Jewish tradition, the phrase “no one knows the day or the hour” is a Jewish idiom which would have been commonly understood by those who Jesus was speaking to, as they were all Jews. The meaning of this phrase relates to the Jewish calendar which is based on a 30 day Lunar cycle. Each month, two reliable witnesses would look to the sky for evidence of the first sliver of the New Moon. Having not seen the New Moon, the two witnesses would say, “No one knows the day or the hour”. Once the New Moon was spotted, the two witnesses would report it to the High Priest at the Temple, who would independently question them before officially proclaiming the first day of the new month. Once the new month was proclaimed fires would be lit on top of mountains within line of sight to spread the message throughout the land. Yom HaKeseh, the Hidden Day, why this Feast must be 2 days long based on sighting of the New Moon by two reliable witnesses. No one knows the Day or the Hour … common interpretation compared to the Jewish idiom of the ‘watchers’. Discuss how the Virgin represents Israel, the male child represents the Church, and how the dragon may possibly be symbolically collective as well. The Church is referred to in the ‘male’ form in – 1 Thessalonians 5:1-6, as ‘Sons of Light’ and ‘Sons of the Day’. G.H. Pember considered this in his book ‘Earth’s Earliest Ages’ copyright 1876. The word ‘harpazo’ is used to describe the Rapture, not the Ascension. Daniel was told that ‘knowledge would increase’..that the vision was sealed up until the End Times… isn’t it now being unsealed? Explanation of Tribulation being a Week of Years, with the Mid-Tribulation event being the Abomination of Desolation. Interesting that Comet P67, the Rosetta Comet, is at Virgo’s feet next to the Moon on 09/23/2017 … too much for coincidence, but what does it mean?